Advantages: Diverse collection of variants which is superbly executed with accomplished artwork. Conclusion: An illustrated look at one of the iconic fighters of WWII. With the use of colour side profiles, the authors give the reader a chance to see the wide and varied range of colours and markings that were applied to these aircraft. 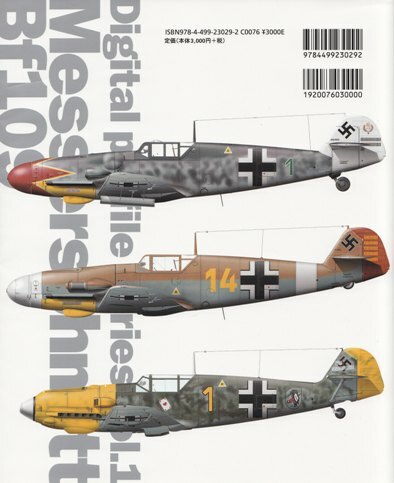 Do you have a Bf 109 kit and need some inspiration choosing a scheme? If so, then this publication is exactly what you need. Essentially it’s a picture book that’s devoted to all versions of this famous Luftwaffe fighter. Within the soft card covers are 80 pages of motivational artwork by Yukinobu Nishikawa. Over 110 colour profiles are presented which range from the early prototypes to their post war derivatives. Starting off we see examples of the V1, V3, V13, V14, and then observe the first of the wartime examples with the 109Bs and Ds getting an airing. Following are a selection of 20 “Emils” and 24 “Friedrichs”. 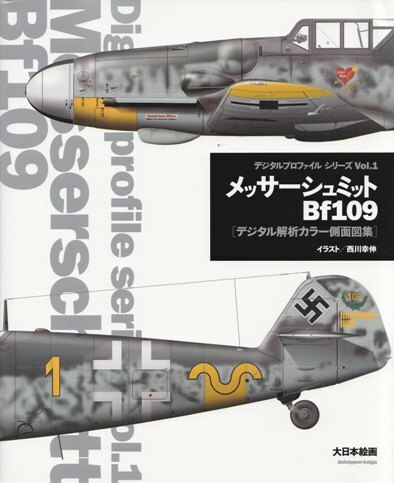 The illustrations then turn to the later types with the Bf 109Gs and Ks contributing 45 and 3 profiles respectively. Even the Bf 109T gets a run. It’s not just the Luftwaffe’s livery that’s showcased. Italian, Rumanian, Finnish and Hungarian schemes are also in the mix and add greatly to the type’s diversity. Various forms of Messerschmitt’s design found their way into use after WWII and a number of them are presented in the final chapter. The Spanish HA-1112K and M are represented as well as the Czechoslovakian and Israeli S-99 and 199s. Each is backed up by some descriptive text in Japanese. This is frustrating for the English speaking reader, especially when a translation could easy have been provided with a little reformatting of the appropriate page. Interspersed throughout the publication are images of Unit emblems, stencil data, and various manufacturers’ plates. All have explanations attached to them but alas...it’s in Japanese only. So if you want some visual stimulus on Messerschmitt’s iconic fighter, this is the book for you. If you understand the native language of the publishers, then you have the added bonus of some reading material as well. Thanks to Yukinobu Nishikawa for the sample.